33 edition of the MILLE SABORDS, from the 27th to the 30th of October ! Every year at this season, here comes the biggest second had floating boat show in Europe. 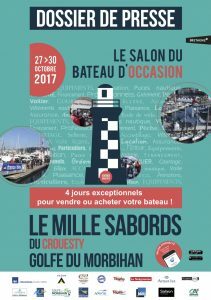 It takes place for his 33rd Edition in the same spot as Usual, on the Ruys Presqu’ile, at le Crouesty Marina, from the 27th to the 30th of October . And off course, a lot more on the book ! Come to see us and take a look.